Clamping shields attach to the frame – not the test head. All Newage clamping shields may be attached without tools. Clamping shields provide a level or protection for the indenter. Standard clamping shield are cut-away on one side to provide visibility to the indenter contact point while also providing some level of protection for the diamond. Enclosed clamping shields provide total indenter protection. They are used where standard shields are inadequate. Shortened, enclosed shields provide total indenter protection in automatic applications. Click on the menu below to see the full range of clamping shields. 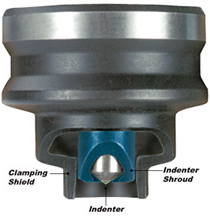 Clamping shield, enclosed, 1" extended. Clamping shield, enclosed, 1.7" extended. 4" Extension Package, includes extended clamping shield with extensions for shroud and indenter. Use with any standard length shroud.